Next week is Valentine’s Day! Some of you might already be planning for a dinner date with their loved ones or special someone. 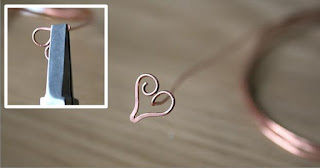 Here’s a quick and simple pair of wire heart earrings tutorial you can re-create so you have something new to wear on Valentine’s Day! 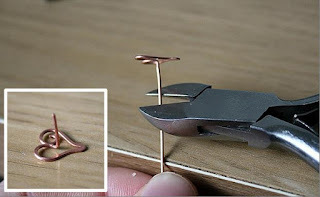 This tutorial from Jeske Hendriks teaches how to make 1 ear stud. Recommended is to make both ear studs of the set simultaneously step-by-step so that symmetry is easier to achieve. Between steps, check for symmetry in size and shape, and adjust the construction if needed. 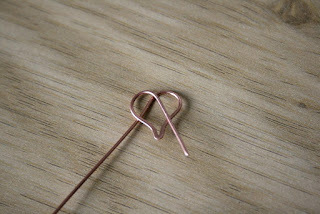 Step 1: Straighten the end of the copper wire (+/- 6cm) by rubbing along it with your fingers for a few seconds. 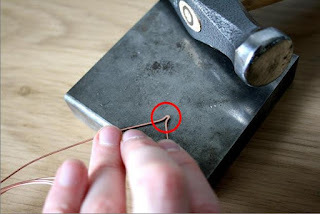 Step 2: Bend over the wire onto itself as illustrated below using flat nose pliers. Step 3: Grab the doubled-over wire with the flat nose pliers and push the two sides against each other. Use little force and do it bit by bit to avoid damaging or kinking the wire. 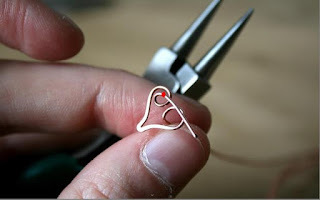 Step 4: Push the two adjacent pieces of wire apart to create the bottom shape of the heart as shown on the picture above. Step 5: Hammer down the angled wire (the part circled in red). This strengthens the construction and looks more professional. 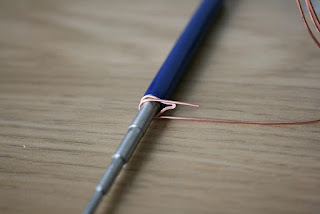 Step 6: Wrap the two ends of wire tightly around a cylindrical object (+/- 5 mm diameter). Step 7: Push apart the loops you just made by wrapping the wire around the cylindrical object. The wire should now be shaped like a heart, as illustrated above. 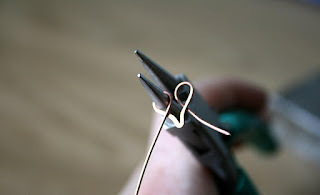 Step 8: Use round nose pliers to bend around the wire for each side of the heart as illustrated above. Step 9: Use the flat nose pliers to bend one of the two wires (preferably the longer wire) in a 90° angle at the place marked with a red dot. In the picture accompanying the next step you can see how it should look from the front. 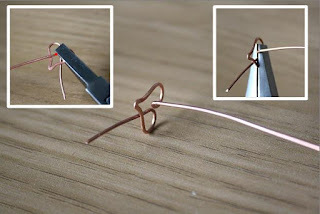 Step 10: Use the round nose pliers to bend the other piece of wire in a decorative coil. 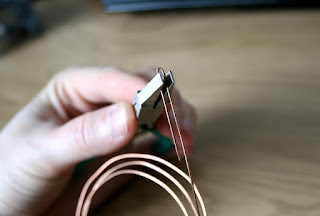 You will cut off the rest of the wire of the coil at approximately the spot marked with a red dot, so take that into account when coiling the wire into the shape that you desire. Step 11: Cut off the wire at the spot indicated in the previous picture and file off any sharp edges. 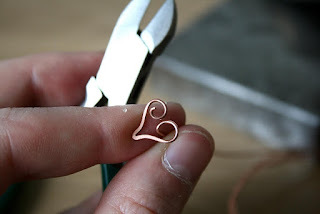 Step 12: Use flat nose pliers to make the coil flush with the rest of the heart. Adjust the shape of the coil or any other part of the heart if needed, either manually or by using (round nose) pliers. 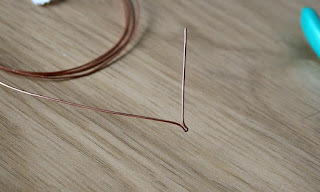 Step 13: Cut off the ear wire at the desired length (Between 1 and 2 cm. If in doubt, try the earring on to see if it sits comfortably) and file off any sharp edges. Step 14: Hammer down the rest of the heart (bumps and coil). If you can’t reach certain parts because the ear wire is in the way, bend that part of the heart shape away (vertically/upward) and bend it back after you finish hammering. 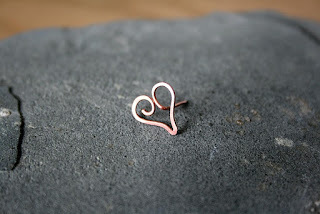 Congrats, you’ve now made a basic heart-shaped ear stud. You can choose the color of the bead you like to put an accent to the wire hearts. Jeske Hendriks use black color 3mm bead and wrapped it on one side of the heart. You can also oxidize the earrings like what Jeske did on her tutorial. 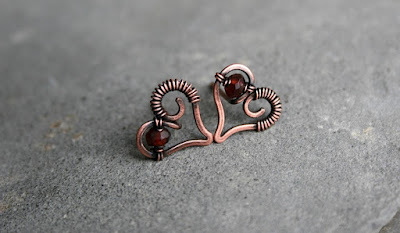 For further instructions on how to wirewrap the bead onto the wire hearts and how to oxidize, a complete tutorial can be accessed through All Access Membership.